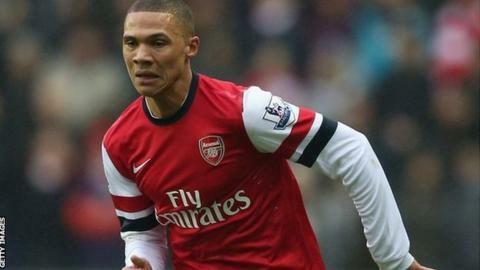 Arsenal defender Kieran Gibbs has been ruled out of action for three weeks with a thigh injury. The England left-back, 23, limped out of Wednesday night's 2-2 draw with Liverpool and will now miss Premier League matches against Stoke and Sunderland, and possibly the Champions League tie with Bayern Munich. "Of course it's a blow for us," said Arsenal manager Arsene Wenger. "He is important for us going forward and the game we want to play." Wenger, who introduced Andre Santos in place of Gibbs on Wednesday, said he would consider signing a replacement before the transfer window closes on Thursday, but added that a move for Spain striker David Villa will not happen. The Barcelona man has been a target of Wenger's but a deal has failed to materialise and, when asked whether it was dead, he said: "Yes."